Gheranda Samhita is a classical text describing seven limbs of yoga as taught by Sage Gheranda to his disciple, King Chandakapali. Sage Gheranda outlines a system which can take the serious aspirant from purification of the body to the highest states of samadhi and knowledge of the soul. Distinguishing it from other hatha yoga systems, Sage Gheranda’s seven limbs includes the tattwa dharanas (concentrations on the elements) and the seamless merging of hatha yoga and tantra by combining mudras, bandhas and pranayamas with mantra, yantra and mandala. The natural flow of this potent process into dhyana and samadhi is beautifully discussed, bringing the teachings to a sublime conclusion. 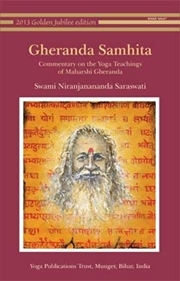 The commentary by Swami Niranjanananda Saraswati guides the modern reader through the details of the practices, many of which are complex, rarely described and cryptically expressed by the sage. Comprehensive instructions are given for all the techniques, while subtle understandings and insights into the underlying philosophy and purpose are presented with beauty and simplicity. The original Sanskrit verses, with transliteration and translation are included.